Departure Beirut in the afternoon to Delhi via Doha. Arrival Meet, assist and transfer to Hotel in Delhi. Afternoon free. Overnight hotel in Delhi. Visit Akshardham Temple and witness the essence of Hinduism at Akshardham Temple one of the biggest and most intricate religious places of worship ever constructed. A visit to this monument is a journey though the gateway to the essence of ancient India and the best of Hindu culture and Vedic civilization. The monument is a fusion of pink stone and pure white marble, where pink stone symbolizes bhakti in eternal bloom and white marble that of absolute purity and eternal peace. (Closed on Mondays) Overnight at the hotel. Day 3 : Delhi – Agra (203 km) 4 Hrs. After breakfast, drive to Agra. On arrival check in at the hotel. Afternoon sightseeing of the Mehtab Bagh, The place is an ideal spot for it provides picturesque view of Taj Mahal. The name Mehtab Bagh means ‘Moon Lit Garden’ and the same was testified by the beautiful reflection of Taj Mahal in the pool at night in Mehtab Bagh. The place has a history of its own. It is believed that the great emperor Shah Jahan who built Taj Mahal for his queen wanted an identical one for himself at Mehtab Bagh. However the archaeological findings have proved the existence of garden complex. Whatever the popular beliefs be, the place is worth a visit as it provides bewitching image of Taj Mahal. Indian dinner at local restaurant. Overnight at the hotel. After breakfast, we will take you for sightseeing tour of Agra which includes beautiful Taj Mahal. First we will visit the majestic marble edifice, Taj Mahal. The Mughal Emperor Shah Jahan built the Taj Mahal in the memory of his beloved wife, Mumtaj Mahal. 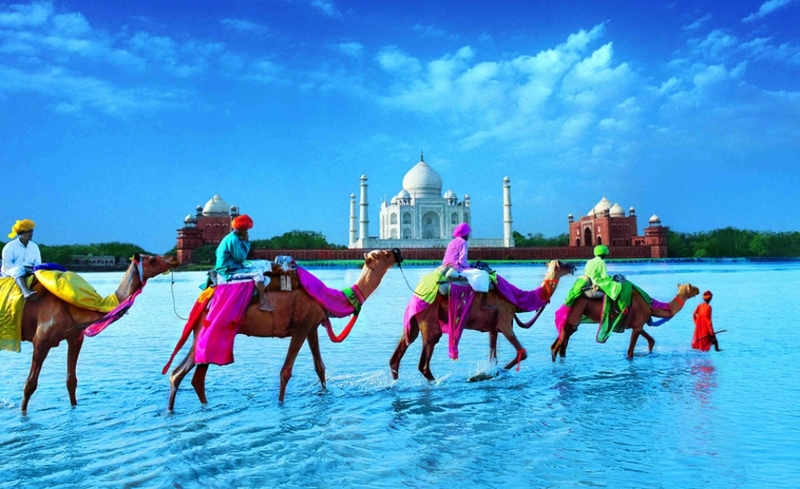 Taj Mahal, the epitome of love and romance stands on the banks of river Yamuna. The architecture is considered as the finest specimen of Mughal style of architecture. The architecture is highly inspired from different styles of architecture, which includes Persian, Indian and Turkish. Taj Mahal architecture is truly splendid and one of its kind in the world. The design & layout of Taj Mahal never fails to enrapture architects, engineers, historians as well as common man. (Closed on Fridays) Visit Agra Fort is among the finest examples of the fusion architecture that has dominated the Mogul period. The assimilation of these different styles has given the buildings within the fort a distinctive look. To name a few, for example, the Jahangir Palace built by Akbar is the most magnificent blend of Persian and local style whereas Divan-e-Aam mixes subtleness of Turkish exteriors with the complex pattern of Persian architecture. Babur stayed in the fort in the palace of Ibrahim. Mohabbat the Taj - A show which has taken seven years of chiseling and carving by 28 craftsmen and designers. Made in pure white Makrana marble like the original 17th century monument, a Taj Mahal replica. This programme has exciting and innovative presentation of a song and drama spectacle involving 60 artists, they have tried to merry the traditional media with the latest gadgetry, audio visual technology, including laser. The Taj will be presented in 10 different moods, representing varying seasons and hours of the day.' The show will a love story set in the 17th century ambience and woven around the Taj. Timings: 06:15 PM Overnight at the hotel. Day 5 : Agra - Fatehpur Sikri - Jaipur (255 km) 5 Hrs. After breakfast, you will drive to Jaipur; while driving towards Jaipur you will stop at Fatehpur Sikri for a brief period. Fatehpur Sikri was once the capital of the Mughal Empire. The city boasts of some of the magnificent monuments of the medieval period. Akbar, the great Mughal Emperor, made it the capital but was later abandoned due to scarcity of water. The buildings at Fatehpur Sikri present a unique blend of Hindu and Islamic architectural styles. Some of the attractions at Fatehpur Sikri are the Panch Mahal, the Buland Darwaza and the Dargah of Sheikh Salim Chisti. On arrival, check-in at hotel. Rest day is free for own activities. Evening enjoy Rajasthani dinner with cultural dances at local restaurant. Overnight at the hotel. After breakfast, you will explore the massive Amber Fort (ascending the fort on elephant back). This morning you will drive 11kms in the outskirts of the city to visit Amber Fort, the ancient capital of the State until 1728. Visit the Temple of Kali, the Hall of Victory or Jai Mahal and Jagmandir. You can have the unique experience of traveling on elephant back to and from the top of the hill on which the fort is situated. It has halls of Public and Private Audience, a Sheesh Mahal (hall of mirrors) various marble palaces which are marvellous examples of ancient Rajput architecture. The Temple of Amba (Mother Goddess), the patron deity of the Royal family is at the entrance to the palace.Afternoon city tour of the pink city, visit the City Palace – the former royal residence built in a blend of the Rajasthani and Mughal styles which houses a museum with a superb collection of Rajasthani costumes and armoury of the Mughals and Rajputs, including swords of different shapes and sizes with ornate handles. It has an art gallery with an excellent collection of miniature paintings, carpets, royal paraphernalia and rare astronomical works in Arabic, Persian, Latin and Sanskrit. Also visit the Jantar Mantar – an astrological and astronomical Observatory built by Maharaja Jai Singh in 18th century, which is remarkable for its accuracy even at the present times. Stop at Palace of Winds for taking pictures. Later back to the hotel & rest. Overnight at the hotel. Day 7 : Jaipur - Delhi (258 km) 5.5 Hrs. After breakfast, drive back to Delhi.Upon arrival, check-in at hotel. Rest day is free for own activities. The ultimate entertainment and leisure destination, sprawling across acres of land, the carnival that is India is distilled into one iconic destination. 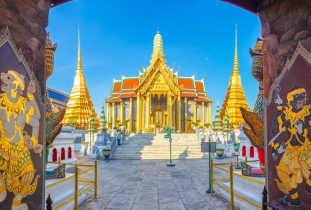 This fabulous Kingdom brings to life a blend of India's art, culture, heritage, craft, cuisine and performing art...all with the technological wizardry of today. It is designed and conceptualised to offer international and domestic tourists a breath-taking, magical Indian experience. It showcases modern & traditional India in an entertaining format to all visitors. Nautanki Mahal: showcasing an extravagant cinematic and theatrical musical. Culture Gully: an elaborate culture, arts, crafts and food boulevard. Showshaa Theatre: a fabulous, colorful drama marquee spotlighting Indian mythology productions, a mock wedding show and the great Indian talent circus. Iifa Buzz: a glamorous Bollywood themed cafe. This is a destination in itself which is capturing the imagination of the world. Get ready for this century’s most novel tourist destination. SHOW OF ZANGOORA – the Gypsy Prince at Kingdom of Dreams. India’s answer to Broadway, Zangoora the Gypsy Prince - The biggest Bollywood musical ever. Introducing a brand new genre of entertainment where storytelling & Bollywood style Song & Dance meet stagecraft and technical wizardry like never seen before. In a world class theatre Nautanki Mahal, enter a world of entertainment that brings the best of Indian and International talent to create a Bollywood spectacle live on stage that is truly cinematic. (Closed on Mondays) Timings: 07:00 PM (Tuesday, Wednesday & Sunday) Overnight at the hotel. Air ticket on Qatar Airways on ”O” booking class : Beirut - Doha - Delhi - Doha - Beirut.